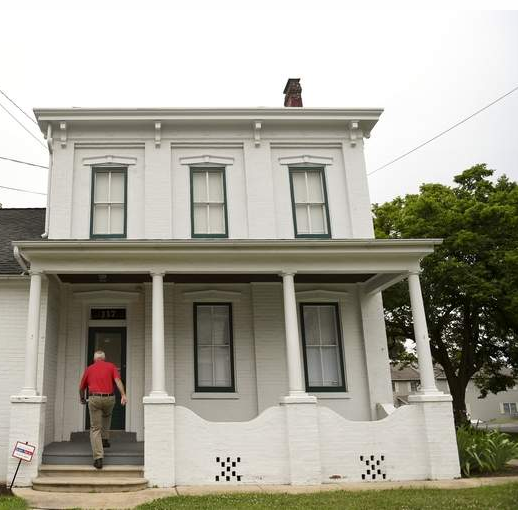 As the Reading Eagle reported today, The John Updike Society, which owns The John Updike Childhood Home, is now planning to hold the grand opening of the museum the first week of October 2020, to coincide with the 6th Biennial John Updike Society Conference at Alvernia University. Previously, the hope was that the grand opening could take place sometime in 2019, but the restoration is still incomplete and society president James Plath said that rather than simply buying display cases and stuffing them with exhibit items, “We want to do things right. We want this to be a world-class museum, something that the residents of Shillington can be proud of.” He said that they need to find a curator to design and install exhibits, working with the knowledge of Updike scholars to identify highly displayable items already in the society’s possession. But as Riley Murdock reported, the society is still looking for a turn-of-the-century or late 1800s slate kitchen sink to install, and a Tiffany-style one-bulb chandelier for the dining room. R.J. Doerr, who has been working on the restoration, still has the side porch to finish and grape arbor to construct. Then the society plans on tearing out concrete walkways and replacing them with brick, as it was during Updike’s time in the house. Additional parking spaces also need to be created before the grand opening, and for the finishing touch a new hedgerow of privet needs to be planted on the perimeter of the property. Plath said that he has several possible curators and exhibit designers in mind, and that the transformation from house to museum will continue once the society hires someone to consult and/or design the flow of exhibits. In the meantime, tours of the house are still available upon request by contacting John Updike Childhood Home director Susan Guay (susan.guay@alvernia.edu) or walking up to the single-story annex of the house and asking for Dave Ruoff. Here is the full Reading Eagle article. The photo is by Lauren A. Little.